This post is contest eligible! Be sure to leave a comment to be entered in the drawing. After getting back from Stitches West 2010, and finishing Steggie, I decided that I needed to get caught up on the Spring Thaw Socks that have been on the needles for a year (yikes!). Looking back, I finished the first sock but stalled out on the second. After picking it up again, I am well on my way to finishing these up. I have noticed a glitch in the pattern though, hence this interim blog post. 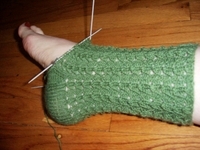 On the second sock (the left one if you are knitting pattern), the pattern has the second series of leaf repeats start in the same place as the first sock above the heel flap. From what I can tell this causes the two series of leaves to be really close together on the leg of the sock. It also prevents the two socks from being mirror-images of each other. I have ripped back on the second sock to the top of the heel flap in order to put the second series of leaf repeats on the other side of the heel. Here is what it looks like, with just one row of the second series completed. I am hoping this will work out better. In a nutshell, on the left sock I am starting the leaves that start above the heel on the right hand side of the heel, whereas on the right sock the leaves above the heel start on the left hand side of the heel. Clear as mud? Hopefully I will have these done soon. While taking Cat Bordhi's seminar on socks at this year's Stitches West, Kris and I fell in love with her Spring Thaw sock. We were able to locate the Knitter's Magazine the pattern is in at one of the vendor booths (Yarn Barn, I'm pretty sure), and I picked up some sock yarn at Miss Bab's to get started. Two months later, I have one sock done! The sock is beautiful. The twisted rib is a pain-in-the-arse. But, did I say the sock is beautiful? It is. And it's well worth it. I still need to cast-on for the second sock. Since it's toe-up and magic loop (something I've only done once, you see), I need to find some quiet time where I'm not utterly exhausted to get it started - like not at night after Jake goes to bed. Hopefully I'll find the time soon, because I would really like to get going on the second! I'm not sure if I ever even blogged about these ages ago. About a year and a half ago I started the Cable Twist Socks (rav link) using STR in Carbon Dating. I finished the first sock. Anyway, I picked them back up to conquer one-sock-syndrome. The second sock is a bit looser. And the pooling is different in comparison to the first sock. I'm chalking this one up to a lesson in gauge. Mine has gotten looser over the last year. This isn't necessarily a bad thing, just in regards to these socks. I'm not at all being zen about it. But I'm not willing to rip out the first sock and re-knit it either. Oh well, I guess they will be mostly house socks. And more importantly, a WIP rises from the ashes and is off the needles. Finally! 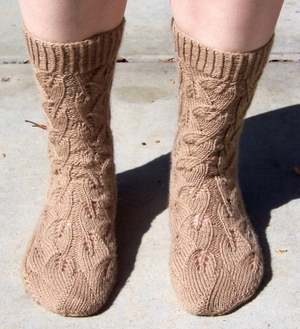 Pattern: Embossed Leaves Socks, by Mona Schmidt. Published in Interweave Knits, Winter 2005. Yarn: Elann's Baby Cashmere in Serengeti Sand (#3724). I used 3 balls, leaving one left over. Needles: KnitPicks Double-Points, US2s (3.0 mm). 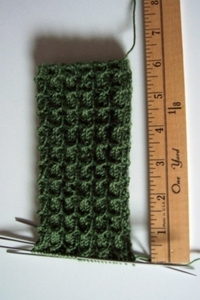 Alterations: I completed a total of six sixteen-row lace repeats instead of the seven indicated for the pattern. My foot size is smaller than the size for the pattern. This change worked out perfectly. Impressions: The pattern is very well written and easy to follow. I really like the twisted rib on the cuff and the effect of the star-type decreases for the toe - this created a very smooth line and, of course, a lovely toe! NOW to decide which socks to make next!! I picked up some Socks that Rock in Carbon Dating at the last Stitches that I'm just itching to play with... but what pattern to use?! Does anyone have any suggestions?? First we had breakfast at Hash House, it was very good as usual. Then we went to the National City Yardage Town Warehouse (I was a bit impressed by their fabric selections considering I have not been impressed by their other locations) where I picked up a dress pattern and fabric for it. Yardage Town was the only store in San Diego where I was able to find Kwik Sew patterns, and it was a huge bonus to find out that they are always on sale for 40% off the suggested price - way better than anything I've seen online! And we were off to the movies. We saw Dream Girls... and I really liked it! It was exciting to see Jennifer Hudson (originally from American Idol) in her acting debut. She was fantastic and well deserving of the Golden Globe! We stopped by Barnes & Noble where I picked up Crochet with Wire by Nancie Wiseman (I can't wait to start a little something from this book). It was then time for dinner, so we headed to Terra for happy hour and dinner. It was great! BTW, I would have to say that Terra has one of the best happy hour deals I have seen in San Diego for a really long time. Definitely check it out if you get the chance! The birthday celebration continued over this last weekend. My parents came to CA and we had a family celebration in Orange County. It was so great - DH grilled up a fantastic dinner and Erika was able to make it too. I was showered will wonderful gifts... Tiffany earrings (you're wonderful E! ), a diamond necklace passed down from my grandmother, and my first ever pair of solitaire diamond earrings (thanks mom and dad!). It was a great birthday!! I still have to weave in some ends... then I must cast-on for the second one, no one-sock-syndrome here!! 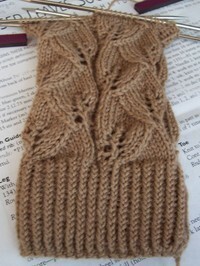 I am using Elann's Peruvian Baby Cashmere (the same yarn I used for the Leaf Lace Shawl), in Serengeti Sand. This is a fantastic yarn... I think I may have to buy more! The twisted knit ribbing was a bit monotonous, but now the rows are just flying by! I am about sixteen rows from starting the heel flap. I may have to consider making the foot portion smaller because I have teeny feet... luckily Mona gives directions on how to do so. 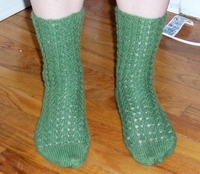 My second pair of socks are off the needles! 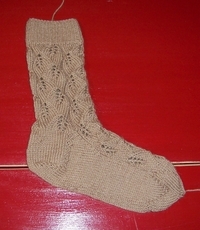 Pattern: Mock Croc Socks, available from KnitPicks as a free download. Yarn: KnitPicks Essential, Grass. Two skeins were used, and I had 34 grams left over from the second skein - adding up to about 305 total yards used. Needles: Innox US0, Double Pointed. Alterations: None. I knit the S/M size and made the leg portion 6.75" before starting the heel. Impressions: I really love these socks. They don't really look like anything special until they are put on and the lace pattern has a chance to shine! I would definitely recommend this sock pattern to others. And immediately cast-on for the next... don't want to have one-sock-syndrome! These are working up so fast... well, fast for me anyway :) The second sock isn't on my goal list for June though, so I think I'll be putting these down for a couple of weeks so I can get a couple more things accomplished... I *really* want to start the Mountain Peaks Shawl! I have finished the gusset decreases and am on my way on the foot portion. Just have four inches to go until I start that toe!